On your marks, get set, go! 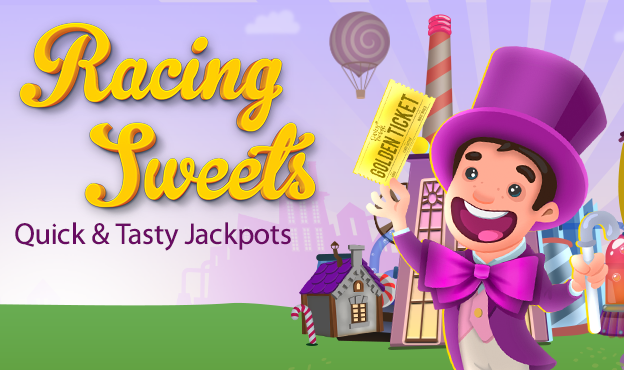 Race to the finish line for scrumptious big jackpots! 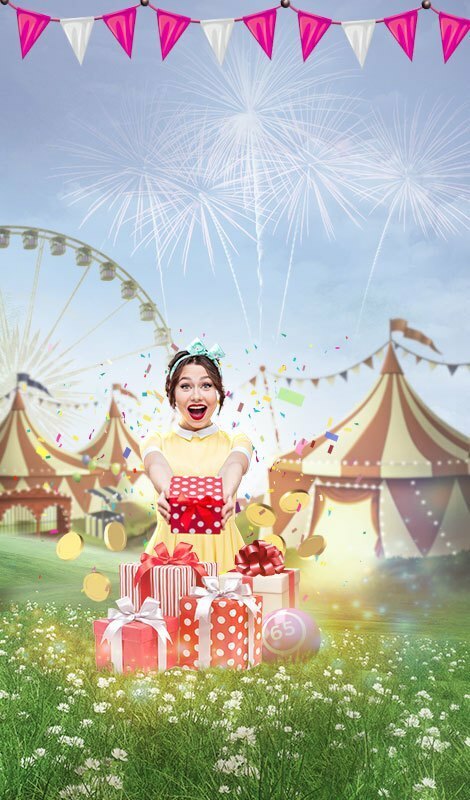 Our new bingo 52 room will be sure to give you a sugar rush with tickets starting from just 5p! With 20 jackpots an hour you'll be licking your fingers for more! The new 52-5 Candy Based variant relatively new version of the classic bingo game. Unlike 90-ball and 75-ball bingo, the game is played with candies instead of numbered bingo balls. Just like in classic bingo, players purchase bingo tickets to a game. Each ticket is called a tray and includes 5 playing cadies out of the standard 52 available numbers. A caller calls out candies randomly and if they appear on the player’s tray, they are covered by the candy. The first player to cover all 5 missing candies on a tray wins the game. In order to play, it is required that you purchase at least 1 ticket in a game. In a single game, you can purchase up to 96 tickets maximum. Before purchasing tickets, you need to fund your bingo account with the right amount of money. You'll be able to see the price per ticket on each ticket’s purchase button. All ticket prices in a game are the same. When purchasing a ticket, its unique identifier will appear next to it as a reference for communicating with support agents. This number will also be available in the game history section of the player’s “My Account” menu. After you purchase tickets for a bingo game, the next step is to wait for the game to begin. You can keep track of the time left until the game starts by checking the buy time countdown, which appears in the top left corner of the bingo screen. If you missed a few calls, you can always check which cards were called in the ‘Calling Board’ tab on the right side of the screen. Additional game information is available on the game info panel on the left, including the number of players who have entered the game (purchased at least one ticket), the available jackpots and how to win. The new 52-5 Candy based variant bingo currently offers only an “auto cover” option, which automatically places candies on the trays. 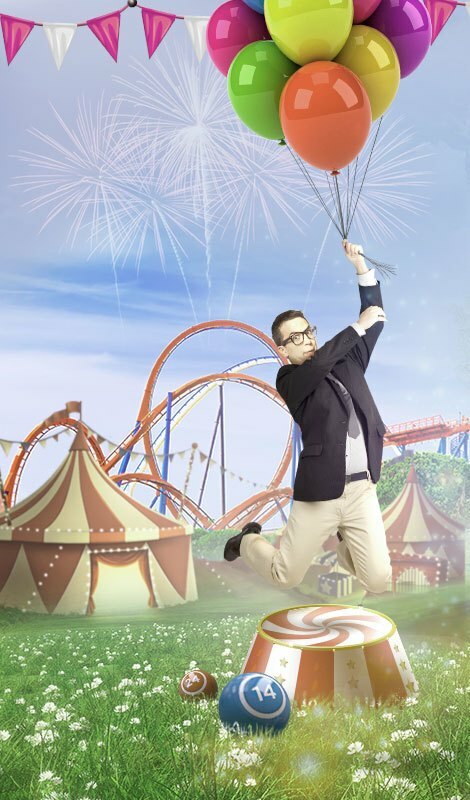 The speed in which your ticket is automatically covered doesn’t affect the outcome, so even if your connection speed is slower than that of another player, and you have the winning ticket, the prize is yours no matter what! If a player gets a Full House on their bingo ticket, the game will end and a winning message will appear including the names of the winners. Since it’s possible for multiple winners to win a single game, the jackpot will be distributed evenly between the winners or by the proportion of winning tickets, depending on the specific game played. If you weren’t in the room in time to see the winning message, don’t worry, you’ll still be awarded your wins and you can see details of previous games in the “game history” section of the “my account” menu. The game Return to Player (RTP) in Bingo 52-5 is affected by ticket price and number of tickets purchased in each game. Some 52-5 game may offer a progressive jackpot. A progressive jackpot is an accumulative reward that is given when a certain criterion is met. Our bingo progressive jackpots are awarded when a player achieves “bingo” in less than a certain amount of calls. To know the criteria for a game you’re considering buying into, simply hover over the progressive jackpot icon in the info panel on the left and a tool tip will appear with the specific number of calls you need to bingo in. If a progressive jackpot is won, you’ll see both the game jackpot and the PJP (progressive jackpot) rewards on a single winning message. Games may be canceled for various reasons, when not enough players have bought into the game, or due to a technical issue. If you purchase ticket for a game which was canceled, you’ll automatically be refunded the tickets’ cost.